The implementation of the Health and Safety Management System, performed during the latest years, was successfully audited by the certifying body on 12th December 2016. 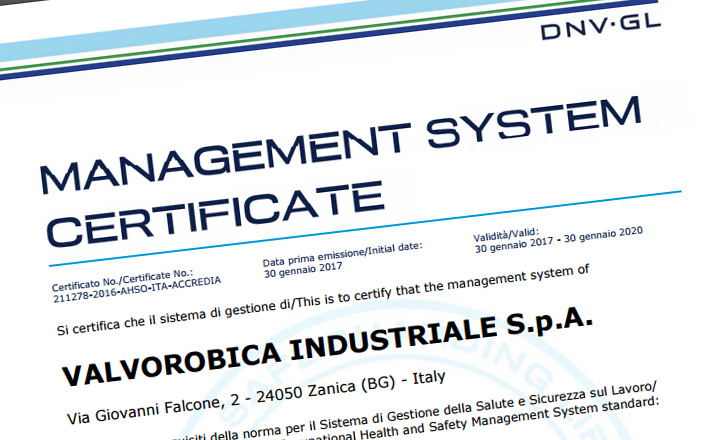 The success confirmed the effectiveness of the company Health and Safety Management System and the attention that Valvorobica Industriale S.p.A. has always been paying to the well-being of its own employees inside the working environment. We remind that this latter certificate completes the most important company certifications, after those concerning the Quality (achieved in 1998) and the Environment (achieved in 2014).